DALY CITY, CA. — The 18th Annual Tristar San Francisco Collectors Show set for April 25-27, 2014 will feature San Francisco 49ers head coach, Jim Harbaugh, at the event. Harbaugh will be meeting with fans and signing autographs on the last day of the event at noon. Fans will be able to receive an autograph on any item for $89. Those seeking an inscription will have to pay an addition $20 charge. Also for $89, fans will be able to have their photo taken with the star coach. Fans can also purchase a Tristar authentication sticker for $7. Admission to the event is $10 per day, however fans can purchase a weekend pass for $26. Photo shows 49ers coach, Jim Harbaugh, signing autographs for fans at the 49ers 2012 Fan Fest. 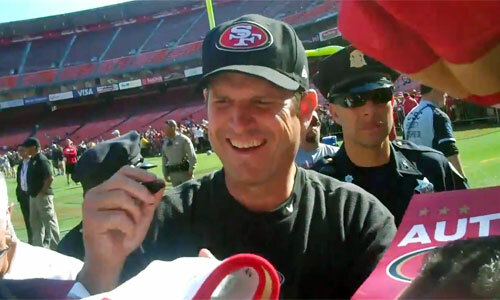 Watch Jim Harbaugh signing autographs at the 49ers 2012 Fan Fest. Jim Harbaugh is a former NFL quarterback and the current head coach of the San Francisco 49ers. If you would like to book football speakers or NFL coaches like Jim Harbaugh for a speaking engagement, autograph signing, product endorsement, fundraiser or special event, contact Jim Harbaugh’s booking agent for appearance and speaker fees at Sports Speakers 360. For booking agent and appearance fee information on how to hire San Francisco 49ers players for appearances for special events, call 1.855.303.5450.